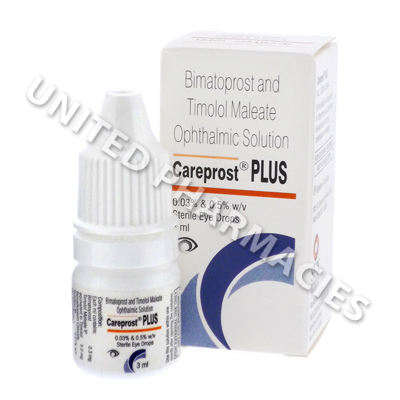 Careprost Plus Eye Drop (Bimatoprost/Timolol Maleate) is prescribed to treat patients suffering from glaucoma. It works by reducing intraocular pressure and ocular hypertension inside the eye ball. Some patients may also use this eye solution to help hypotrichosis, a condition of the eye lashes where hair growth is deficient. This product helps this condition by lengthening, thickening, and darkening the lashes. Please note, however, the patient will only experience these effects while still using Careprost. When using Careprost Plus Eye Drop (Bimatoprost/Timolol Maleate), the correct dosage will depend on the condition being treated and the individual patient. Strictly follow all instructions given by your doctor. Never self-medicate or adjust your dose yourself. When treating glaucoma, the usually dose is 1 drop per day administered to the affected eye. When used to treat hypotrichosis it must be administered using a single-use applicator which can be bought here. Application is fairly easy, simply drop the solution onto the applicator and brush across the base of the eyelash. Use a new applicator for each eye, throwing the used applicator away each time. Side effects can occur when using Careprost Plus Eye Drop (Bimatoprost/Timolol Maleate). Report all side effects to your doctor. If any persist, worsen, or become bothersome, inform your doctor as soon as possible. Before you begin using Careprost Plus Eye Drop (Bimatoprost/Timolol Maleate), disclose details of any of the following to your doctor. Also consult your doctor if you use contact lenses, are pregnant, planning a conception, or if you are breastfeeding. * We also sell Eye Brush Applicators specially designed for applying this product to the eyelashes. Click here for more information.